Arctic Doom or Arctic Boom? 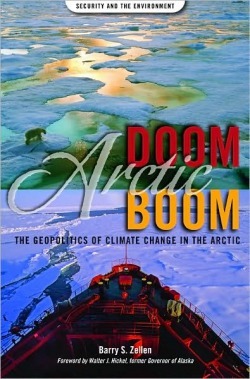 My third Arctic book, Arctic Doom, Arctic Boom: The Geopolitics of Climate Change in the Arctic was published on October 13, 2009 by Praeger Books as the very first volume in its Security and the Environment series. Classroom Bulletin on Foreign Affairs website. On February 13, 2010, Governor Walter Hickel (ret.) very kindly mentioned Arctic Doom, Arctic Boom in his Anchorage Daily News column, We Must Use Our Arctic Resources Wisely. And on December 13, 2009, the Juneau Empire published my "My Turn" op-ed, Opportunity in a Post-Arctic World. As well, here's a link to my op-ed in Canada's Financial Post on October 27th: An Ice-Free Boom. This is a timely and topical book addressing the geopolitical future of the Arctic in a time of dramatic climate change. Already on page two, Zellen cites the record low sea ice summers of 2007 and 2008 as reported by the National Snow and Ice Data Center and the risks of thawing permafrost. Suitably impressed, I read on! There are two Forewords: one by Walter Hickel, former Governor of Alaska—“The day of the Arctic is upon us” addresses sustainability and the ‘commons’ in Alaska; one by Daniel Moran, Professor of Security Affairs at the U.S. Naval Postgraduate School—“From Ultima Thule to the Midnight Sea” notes old ideas on the Arctic Ocean and the prospect of it becoming open in the future. The author is Director of the Arctic Security Project at the Naval Postgraduate School's Center for Contemporary Conflict. ... While noting the stresses that rapid climate change is imposing on the Arctic environment and its peoples, the concluding section is mostly upbeat on the opportunities that a more open polar sea will afford. Extensive notes, references cited, and an index round out the book. Who is the book intended for? It is a mixture of information about climate change and environmental responses, military and geopolitical history, and futurism. In places the themes seems a little repetitive, but overall it is an easy read. It will be useful to residents of the north and scientists who work there, policy makers, and businesses with Arctic activities. Zellen (National Security Affairs, Naval Postgraduate School) explores the geopolitics of the circumpolar North from both a historical and contemporary perspective, arguing that global warming is changing our very conception of the Arctic. While climate change is wreaking environmental havoc on plants, animals, and indigenous people, it is also opening up the Arctic Ocean to commerce and energy exploration. The author suggests that these new economic opportunities at least in part offset global warming's bad effects. Zellen also discusses the strategic role of the Arctic in the defense of the U.S. This book effectively presents a perspective not usually heard in discussions of global warming and the Arctic. Praeger is an imprint of ABC-CLIO, LLC. And in the June 2010 edition of ARCTIC is a review by Dr. Stephanie Irlbacher-Fox, of the University of Toronto, in which she very kindly wrote, "Zellen has written a book that will make us think, and for that, his contribution should be lauded and welcomed." Thanks Stephanie! "Zellen is an important voice in the debate on the future Arctic. One could disagree with statements made in his work, but they give the reader both new insights and a fresh introduction to emerging challenges and opportunities in the ‘new’ Arctic. ... Zellen aims high and touches upon a wide range of highly interesting approaches on how to grasp and analyse the challenges and opportunities in the region. One could argue that this leads to a lack of analytical depth, but at the same time this wide scope offers its audience easy access, insight and plenty of food for thought into a wide range of pressing topics within the area of post cold war international relations. The book is a central contribution to the debate on the future of the Arctic." In October 2012, Anders Frandsen wrote to tell me: "Your work is very interesting - the book Arctic Doom, Arctic Boom was so useful when I wrote my master's thesis about the security agenda in the Arctic."